At this weekend’s Portimao WorldSBK round, Ana Carrasco could become the brand new WorldSSP300 World Champion. The options for her to take the crown at the Portuguese Round do exist, but for that to happen a number of other results must go her way, taking into account her title rivals’ respective performances. 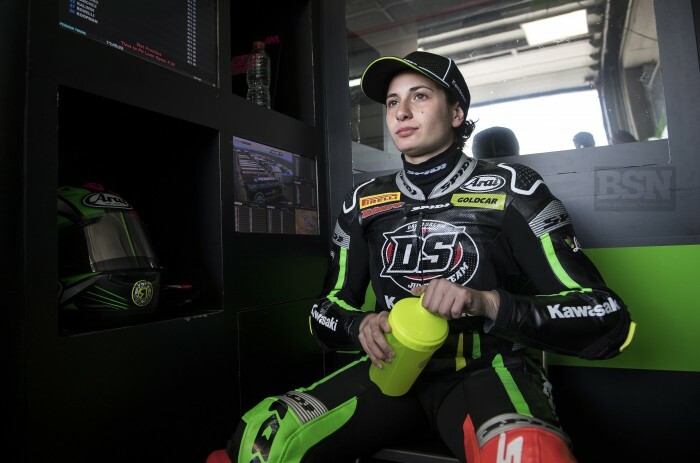 The Spaniard shot to the top of the championship standings after her dominant triumph at Imola, the third race of the 2018 WorldSSP300 season, and she’s managed to keep and extend her lead since then and until now, with just two races remaining. Standing on 84 points, Carrasco has a 16-point advantage over Luca Grunwald (Freudenberg KTM WorldSSP Team), her closest rival, and a further ten over Borja Sánchez (ETG Racing), who sits third in the standings. Scott Deroue (Motoport Kawasaki) is also in line, fourth in the championship and 29 points behind Carrasco. Wins the race and Grunwald finishes lower than 2nd place. Finishes 2nd, Grunwald finishes no higher than 5th, and Sánchez/Deroue do not win the race. Finishes 3rd, Grunwald finishes no higher than 9th, Sánchez finishes 4th or worse, and none of Scott Deroue, Dorren Loureiro, Galang Hendra Pratama or Mika Pérez win the race. Carrasco could also become world champion this weekend by finishing anywhere from fourth to seventh, but in that scenario a highly implausible set of results would need to go her way, affecting not just her closest rivals but everyone from second to ninth in the standings.